Madison, a city of Wisconsin, capital of the state and of Dane co., situated in lat. 43° 4' N., lon. 89° 23' W., 75 m. W. of Milwaukee; pop. in 1850, 1,525; in 1860, 6,611; in 1870, 9,176, of whom 3,114 were foreigners. It is built in the midst of the " Four Lake region," so called from a chain of beautiful lakes which extend over a distance of 16 m. and discharge their surplus waters into Yahara or Catfish river, a tributary of Rock river. Mendota or Fourth lake, the uppermost and largest, is 9 m. long, 6 m. wide, and from 50 to 70 ft. deep in some places, and fed chiefly by springs; it has beautiful white gravelly shores and pure cold water. Monona or Third lake is 5 1/2 m. long and 2 m. wide, and Lakes Waubesa and Kegonsa are each about 3 m. in length by 2 m. in width. The city of Madison occupies an undulating isthmus between Lakes Mendota and Monona, and in point of situation and scenery is the most beautiful city in the west. It is about 3 m. in length and 1 m. in breadth, and has wide, straight, and regular streets, with many beautiful buildings. The capitol, placed in the centre of a square park of 14 acres wooded with native timber, is built of limestone, and commands a fine view. It has recently been enlarged and improved at a cost of about $550,-000. The length of the N. and S. wings is 228 ft., and of the E. and TV. 226 ft. The height from the basement to the top of the dome is about 200 ft. The court house and jail are situated near the S. corner of the park. The university of Wisconsin, with four buildings, stands on a picturesque eminence a mile W. of the capitol, and 125 ft. above the lakes. (See Wisconsin.) The soldiers' orphans' home stands on the shore of Lake Monona, about a mile from the park. The building of the state hospital for the insane, 569 ft. long, on the N. shore of Lake Mendota, 4 m. N. of the capitol, is surrounded by grounds containing 393 acres, partly wood and farming land, and partly laid out and adorned. There is a United States court-house and post-office building, which cost about $400,-000. Madison has railroad communication with Chicago, Milwaukee, Green Bay, St. Paul, and other points, by means of the Chicago and Northwestern and the Chicago, Milwaukee, and St. Paul lines. It is surrounded by a fertile country, has an important trade, and contains manufactories of carriages and wagons, furniture, agricultural implements, woollen goods, saddlery and harness, flour, ale and beer, iron ware, etc. There are a state bank, a national bank, two savings banks, graded public schools, including a high school, two daily, one tri-weekly, and five weekly (two German) newspapers, and 14 churches. The principal libraries are the following: state historical society, 57,254 volumes; state, 7,500; university and societies, 6,830; Madison institute, 3,500; state agricultural society, 1,000. 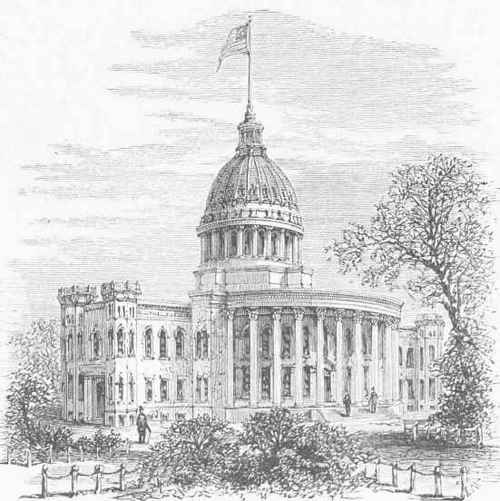 - Madison was selected as the territorial capital in 1836, while yet a wilderness, and in the following year the building of the capitol was commenced. Madison, a city and the county seat of Jefferson co., Indiana, on the Ohio river, 90 m. below Cincinnati and 44 m. above Louisville, and at the terminus of the Madison division of the Jeffersonville, Madison, and Indianapolis railroad, 85 m. S. S. E. of Indianapolis; pop. in 1850, 8,012; in 1860, 8,130; in 1870, 10,701), of whom 2,194 were foreigners. It is beautifully situated, at an elevation secure from floods, in a valley about 3 m. long, enclosed on the north by a range of hills 400 ft. high. The streets are regularly laid out, and a large proportion of the houses are built of brick. It is lighted with gas and supplied with water by an aqueduct. Steamers ply daily to Cincinnati and Louisville. Madison contains several pork-packing establishments, and has an important trade in provisions. There are also brass and iron founderies, flouring mills, planing mills, tanneries, breweries, machine shops, etc. The banking capital amounts to $650,000, distributed between two national banks and one state bank. There are graded public schools, including a high school, a library of 4,000 volumes, a daily, a semi-weekly, and two weekly newspapers, and 15 churches. Madison was first settled in 1808. New Jersey I. A Post Village Of Chatham Township Morris Co., on the Morris and Essex division of the Delaware, Lackawanna, and Western railroad, 24 m. W. of New York; pop. about 3,000. It is the seat of Drew theological seminary, chartered in 1866, and organized in 1867. This institution was founded by the Methodists, and named in honor of Daniel Drew of New York, who gave $250,000 for its establishment, which sum has been increased by successive donations to nearly $1,000,000. The grounds comprise 9o acres, the greater portion of which is handsomely laid out with walks and drives, and adorned with trees and shrubbery. The three seminary buildings are situated near the centre, and are flanked on either hand by the professors' residences. The number of professors and instructors in 1873-'4 was 8, besides several lecturers; number of students, 104, of whom 28 were in introductory classes and 15 in special courses; volumes in the library, 10,000; alumni, 54. The regular course comprises three years. The introductory course is two years, corresponding to the freshman and sophomore years of most colleges. Georgia II. A Post Village And The Capital Of Morgan Co., on the Georgia railroad, 60 m. E. by S. of Atlanta, and 175 m. N. W. of Savannah; pop. in 1870, 1,389, of whom 770 were colored. It is pleasantly situated in the midst of a fertile country, from which it derives an active trade. It has a weekly newspaper, and is the seat of the Georgia female college (Baptist), established in 1850, which in 1873 had 5 instructors and 58 students.